New Municipal Bond offering scheduled the week of Oct 1, 2018, include muni debt deals advanced by the New Jersey Transportation Trust Fund Authority and Dormitory Authority of the State of New York. 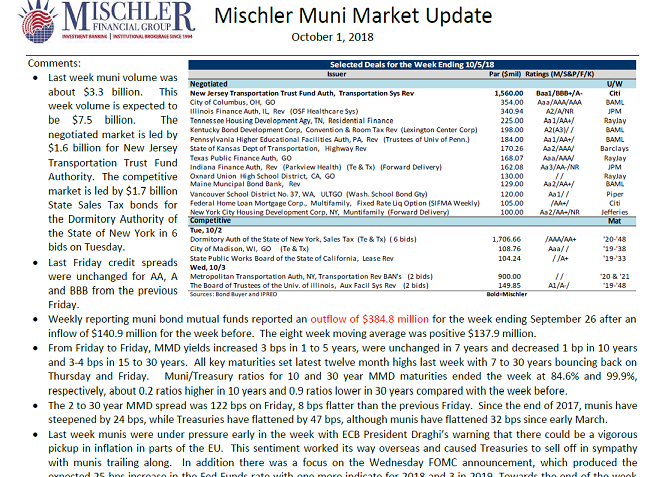 As always, the Mischler Muni Market Outlook provides public finance investment managers, institutional investors focused on municipal debt and muni bond market participants with a summary of the prior week’s municipal bond market activity, including credit spreads and money flows, and a look at pending municipal finance offerings tentatively scheduled for the most current week. Last week muni volume was about $3.3 billion. This week volume is expected to be $7.5 billion. The negotiated market is led by $1.6 billion for the New Jersey Transportation Trust Fund Authority. The competitive market is led by $1.7 billion State Sales Tax bonds for the Dormitory Authority of the State of New York in 6 bids on Tuesday. 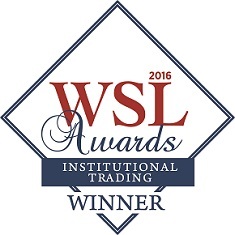 Below and attached is neither a recommendation or offer to purchase or sell securities. Mischler Financial Group is not a Municipal Advisor. For additional information, please contact Managing Director Richard Tilghman at 203.276.6676. During first half of 2018, and full years 2017 and 2016 alone, minority broker-dealer Mischler Financial Group Inc. underwriting roles (for which MFG has led, co-managed and/or served as selling group member) have included more than $625 Billion (notional value) in new debt and preferred shares issued by Fortune corporations, as well as debt issued by various municipalities and US Government agencies.